Plan: Wake up, mail granola to giveaway winners, head to 9:30 am spin class, come home and shower, eat and get some work done before taking my car in to get an emissions test again (the last one didn’t go through the system properly). What happened: I woke up and went downstairs to find my dad finishing the last of my cereal and throwing away my bananas. He thought a brown banana meant it was bad. In my book, brown banana = breakfast perfection. I stopped him before he could do any damage and grabbed my own banana as a pre-workout snack. Granola got mailed, but then as I was driving to spin…. CRASH. Completely my fault. I just wasn’t paying enough attention and couldn’t slow down fast enough at a red light coming up ahead. Luckily no one was hurt and the woman I hit was extremely nice about it. I started crying and she started apologizing to me! In the grand scheme of things it’s not the end of the world (which by the way did NOT happen today as predicted), but it just wasn’t a fun way to start my Saturday. At least the police man took pity on me and didn’t write me a ticket. So yeah, didn’t quite make it to spin class. But since it ended up not raining, I came home and went for a 7 mile run instead. The run was just what I needed to calm myself down. 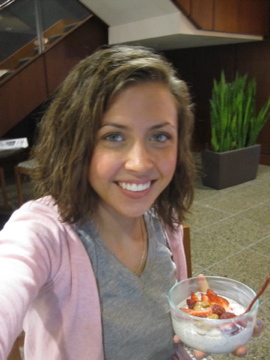 I was a completely new person afterward! ❤ running. Post run activities included a date with the foam roller and some light ab work. Before hopping in the shower I prepped some overnight in the shower oats. My usual mix of 1/3 cup oats, Oikos 0% plain, 1t chia seeds, cinnamon, stevia, water. I stirred in 1/2 a banana before topping it with one of those massive strawberries and some almond butter. I had to get to that emissions test so I brought it with me and now I’m sitting in the waiting area using their WiFi and eating. I think I’m going to hit the mall for a bit this afternoon and possibly go to 5pm Mass. I have my first Health History practice session tonight for IIN and I’m so excited and nervous! And I’m thinking a glass of wine with a friend tonight is absolutely necessary. Hope your Saturday IS going as planned! Have you ever been in a car accident? Serious or minor? I live in my sorority house and my house mom hit my car right as I was leaving to go home for Christmas break. Then she yelled at me and drove away. Cops were called. But eventually she came back and gave me insurance info. But major tears were shed. Oh yikes, glad you’re okay! So scary! 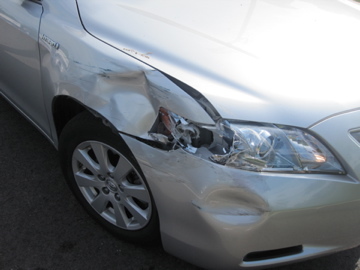 Ive been in a few minor accidents when others were driving…but none by myself…thank goodness! I’m so glad it was a minor accident and no one was hurt! Runs are so good at making anything and everything better 🙂 glad yours was good! So sorry to hear about your fender bender..but I am very glad that NO one was hurt! Great that the rain held off for you too. Running is the best way to get a clear head! Omg I’m so glad to see you smiling. Glad you’re okay girl! Hang in there for the rest of the day! AHH so happy things are okay though! what a start to the day! I have been in a car accident, it wasn’t my fault and instead of apologizing the woman told me ‘she was having a very bad day and couldn’t deal with this’…I didn’t react well. Sorry about your morning though! O MY GOSH, i wrecked my baby honda in that exact same spot last week. It was my first accident. The lady actually hit me but I was supposed to be yielding and she came quickly out of a wooded neighborhood. Breaks my heart :(. Your not alone though! Ugh I hate car accidents glad your ok though!!! This is a weird question but were did you get your spoon?? I love it! I am so glad you and the other woman are okay! That is what matters most. 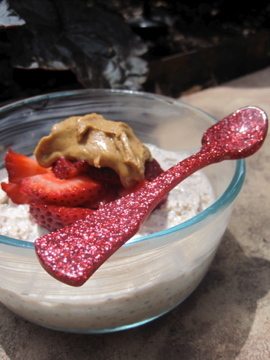 by the way, I LOVE your sparkly spoon! so much pizazz! Where did you get it? Oh no! Glad to see you’re okay! 🙂 I have been in a couple of car accidents but only one when I was driving. I got rear ended on the busiest street in town. It was frightening but nothing too serious.